"We don't know what to make of ourselves," starts Mark Dery in his Escape Velocity: Cyberculture at the End of the Century, "precisely because we are, more than ever before, able to remake ourselves." Exploring notions, like Dery's, of the human body in this digital era is curator Nina Czegledy, with the interdisciplinary line-up she has choreographed, for the Digitized Bodies - Virtual Spectacles project, which has consisted of an online discussion forum, a public lecture series, an exhibition, a screening at the Goethe Institut, and a performance at the Glenn Gould Studio. With a background in both medical research and creative pursuits such as ceramic sculpture and documentary filmmaking, Czegledy's approach for this project was to bring together a wide variety of opinions to expose a greater number of people to new perspectives on the theme. And rather than "conclude the discussion in the conventional manner of a summary," she says, she looked to "leading examples of artistic statement" in relation to the social play of such technology. The work of sound artist Atau Tanaka, for example. His Corporeal performance November 24 illustrated lucidly Donna Haraway's insight about bio-medical technological advancements giving birth to "couplings between organism and machine" in A Cyborg Manifesto. 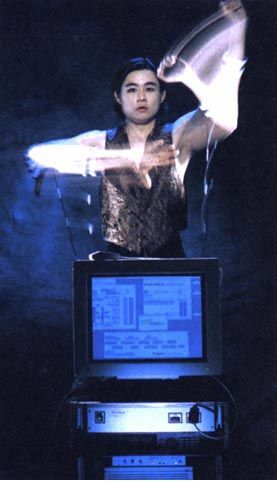 On stage, Tanaka explored the gestural articulation of the body as an electronic musical instrument, with the help of his BioMuse, a neural musical instrument controller that he has been performing with since 1992, during his graduate work in computer music at Stanford's CCRMA (Center for Computer Research in Music and Acoustics). An invention of medical researchers, the BioMuse was designed to pick up EMG and EEG signals from "sticky electrodes on the skin" and turn them into MIDI signals - "signals to control digital synthesizers," explains Tanaka. While hooked up electronically to his Apple PowerBook, Tanaka clenched his fists and shaped things with his hands, as if molding clay, "but there is no clay, " he smiles. "I'm not holding on to anything. "It's a process of discovery," he says, about the responses from and interplay between the BioMuse and his body. The Intimate Perceptions exhibit at InterAccess Electronic Media Arts Centre (showing until December 9) explores "the ways in which the rapidly developing technologies affect our perception of our bodies, our lives, our imaginations, and our very future," says Czegledy. Playing on all of these levels is Jack Butler's video projection piece Genesis of Breath, which speaks to his many years of scientific inquiry into breath and breathing. The installation digitally dissolves medical research pictures onto a frosted glass screen (engraved with a geometrical pattern that connotes such phenomena as an arctic lake, Islamic tile work, and bubble clusters), within a metal and fiberglass construction that is at once an imposing piece of medical machinery and the conceptual space of the breathing chambers of the human lung. For Butler, Genesis of Breath "reifies the conflict present in both my working postures - as an artist producing science and as a scientific researcher producing art." Czegledy, with design and programming help from the C3 Centre of Culture and Communication and Ars-Wonderland Studio (both based in Budapest), put together a CD-Rom for the exhibit that examines post-industrial society's fascination with bio-medical technology. The opening narration offers a comment from Gandhi. When asked about Western civilization, he said he was most fascinated with the ease in which the population would simply "... hand over the custody of his body to the experts... as if it were an appendage... for which he bore no responsibility." As the interactive piece continues, over twenty scientists, clinicians, cultural theorists, and art historians from three countries (Canada, Hungary, and Slovenia) speak on the same topic. Czegledy's motivation for doing this CD-Rom was the gap she noticed over the years between art and science. She says, "I thought it would be very important to close this gap, in a mini-way." The Wired Body/Mediated Body screening of international videos was organized around such themes as the objectification of the body, as in Joan Jonas's "Vertical Roll" (1972), where she depicts her own body as a collection of parts. A mesmerizing piece in black and white, it moves frame by frame to the rhythm of a banging spoon, so the theme of dismemberment is enhanced even further by the equally jarring viewing experience. With Piotr Wyrzykowski's "Watch Me" (1996), the body is dematerialized into binary code and blocks of sliding pastel colours. Diane Nerwen's "Under the Skin Game" (1996) investigates the bodily ethics and discourses around clinical and experimental technologies; Nerwen juxtaposes clips from Betty Davis movies and Ella Fitzgerald's "I've got you under my skin" with disturbing statistics about governmental attempts to use Norplant as a means to control the "underclass" population. Justine Cooper's "Rapt" (1998) examines new digital and enhanced imaging technologies in medical science. Portraying her own body as transparent, using MRI scans, she renders herself "nakedly public," in the words of Barbara Stafford, who continues to say, "These medical technologies destabilize the already precarious borders between the exterior and the interior as they visualize the invisible." Which leads to the obvious conclusion that technology has advanced way beyond human sense limits into the realm of yet to be defined computer sense limits. And, as a result, we are beginning to abandon what is "naturally" ours: we have, for example, electronic vision with electron microscopy and super-human strength with robotic arms and dismembered voices with telephone voicemail. We are able to manipulate the human form on a computer screen with the click of a key, view the inner workings of the human body with surgical micro-cameras, and visualize individual genes on chromosomes. As Czegledy says, "The extensive use of these technologies has contributed to a radical shift in bodily thinking... where before it was just flesh and bone; now it is a mass of various readings, each one giving a different character to the whole." In addition, she continues, we're now able to see the body in plural ways: via electronic pulses, magnetic cadences, and thermal signatures, for example. And as we continue to venture further along this path, we risk becoming increasingly detached from our own bodily self-knowledge. Or do we? Haraway, for one, champions the notion of human as cyborg and encourages her readers to seize this opportune time to re-imagine the body with ambiguous boundaries. "Nobody has the answers," says Czegledy. "But more important than having the answers is asking the questions." To keep abreast of this project, made possible by the support of the Japan Foundation (in Canada and Tokyo) and The Daniel Langlois Foundation for Art, Science, and Technology (Montreal), log on to http://www.digibodies.org. A Digitized Bodies - Virtual Spectacles book/CD-Rom package will be available for sale in the Spring of 2001 and the Synapse Forum will continue online as the exhibit moves from Toronto to Budapest (Ludwig Museum, 2001) to Ljubljana (City Gallery, 2002).